The only thing worse than your bread loaf not shifting at all is overproving it. 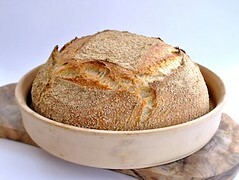 Unless you have a bread oven and gracefully slide your loaf in, without having to plonk it onto the stone, into the cast iron dish or La Cloche, you risk it deflating and going squidgy and gloopy at the sides, as the oven spring won't manage to make up for the flop. 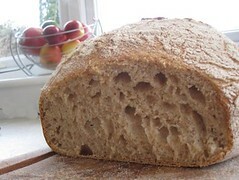 I've foung that on an average loaf, like the ones below, as well as some rustic yeast breads, 40 minutes in a warm place is about optimum. 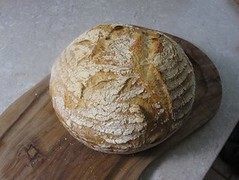 Halfway through I start preheating the dish or stone and by the time the dough is ready to bake, it will only have risen a little - but the oven spring will do its magic then.